Any equine enthusiast is well aware with the struggles associated with loading a horse into a trailer. It’s natural for your horse to experience nervousness and anxiety when being loaded into a trailer whether it ‘s the first or fifteenth time. The tight confines, unfamiliarity with the space, and noises produced by the trailer all present challenges in convincing your horse to board with confidence. Providing the right incentives can seem complex at first, requiring a dedicated amount of persistence, patience, and consistency. However, following these tips and tricks will ensure a smoother loading experience the next time you decide to transport your horse. The number one rule when solving your trailer loading issues is to exercise patience. This will provide a soothing and calm atmosphere for the period of trial and error in coaxing your horse to board the trailer. Although anger and frustration are inevitable if your horse’s stubbornness prevails, it will prove to be counterintuitive and potentially dangerous for the loaders and horse alike. Allow your horse to sniff around and explore the limits of the trailer prior to boarding. Veteran equine handlers are often weary of providing feed as an incentive because this has the potential to create an unwanted positive feedback loop for your horse. There will certainly be times when feed is unavailable during times of boarding, and it’s crucial to be able to entice your horse into the trailer with alternative methods, using feed only as a last resort. Equine experts unequivocally agree that establishing cues with your horse is the most effective method to convince them to enter your trailer. 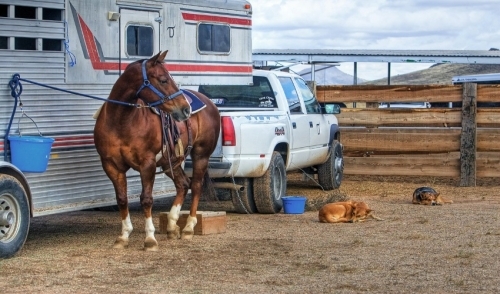 This allows you to naturally build trust with your horse so that they will be able to board your trailer amidst a diverse set of circumstances. This definitely takes some sort of time investment; so don’t be discouraged if your first few cue-creation sessions prove to be unsuccessful. Begin by tapping your horse’s leg or hip from the side, while having a helper coax the horse into the trailer near the loading area. It may help to use some pull ropes at first, making sure to never use them in an overly aggressive manner. In addition to tapping your horse’s leg, point the nose towards the trailer entrance, making it the main area of focus. After your horse has begun to ascertain the leg tap, vocal coaxing, nose-orienting cue, remove the pull ropes to see how they respond without them. This cadence will hopefully teach your horse that it’s time to begin moving into the trailer. Lastly, it’s important to always finish your training sessions positively. Never appear overtly frustrated or discouraged, as horses are adept in reading human emotions. Avoid any sort of negative connotation associated with entering the trailer, as following training sessions will become much more difficult. Remember that the three crucial components are persistence, patience, consistency, and of course, establishing trust with your horse in solving any trailer loading problems.